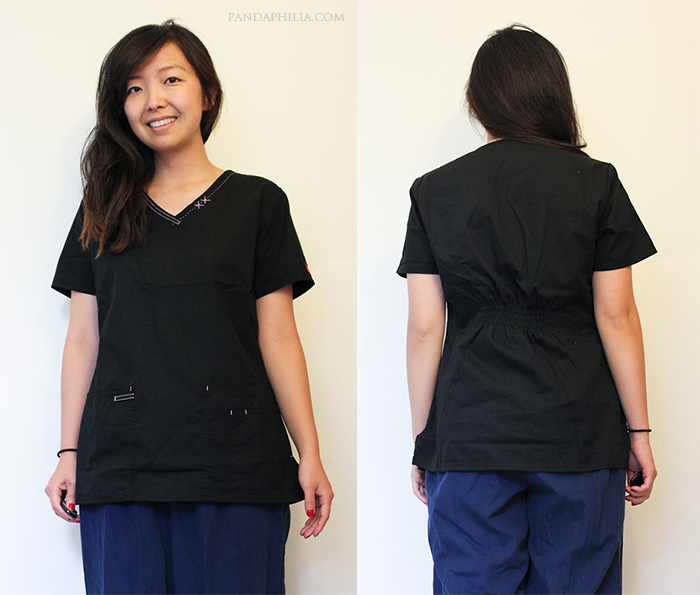 Today I'm going to show you a less glamorous side of my life as a med student: SCRUBS. As a petite gal, I quickly learned that most things in the medical world are also against my favour: surgical instruments too big for my baby hands, never any small (or xsmall) gloves stocked in lab, hospital scrubs labeled XS that I could take a swim in. 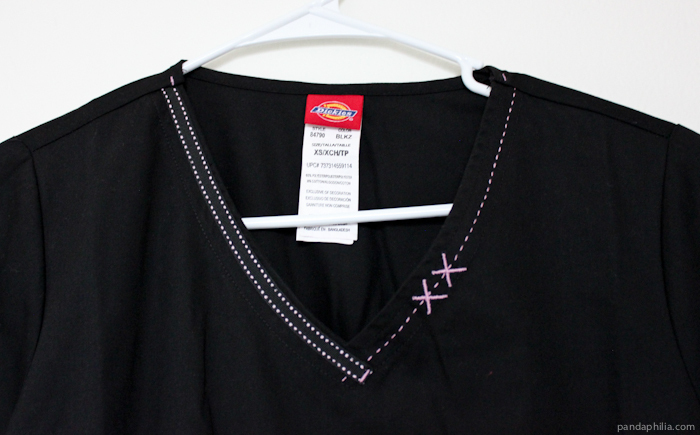 Luckily fitted medical scrubs do exist somewhere and Uniformed Scrubs sent me one of their new Spring/Summer Dickies scrub tops to review. When I pulled these over my head, I was shocked to see that it actually conserved some of my figure because of the cinched back and flared sides (with side slits to fit around curves better). These are thick enough that I don't have to wear an extra tshirt underneath so it saves my normal laundry from smelling like formaldehyde and provides better protection against splashes. Though one of my classmates does actually wear heels to anatomy lab, I'm simply using them for demonstration purposes so that my old scrub bottoms don't look even baggier. As you can tell from the photo above, the fit is still loose enough to allow movement but not a bad case of the "boxies" like on the right. I'm grateful our hospital scrubs are free to borrow but the powder blue potato sacks are not the most stylish thing to parade around in. Believe it or not, the blue top I'm wearing is an XS ! 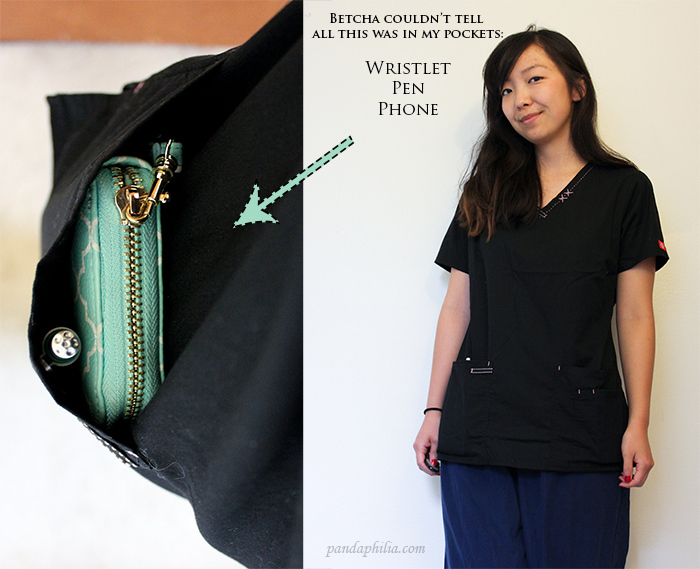 The right pocket is large enough to fit my full sized wristlet while the left is a larger one with a smaller one in front (a nice place for my phone, for example). 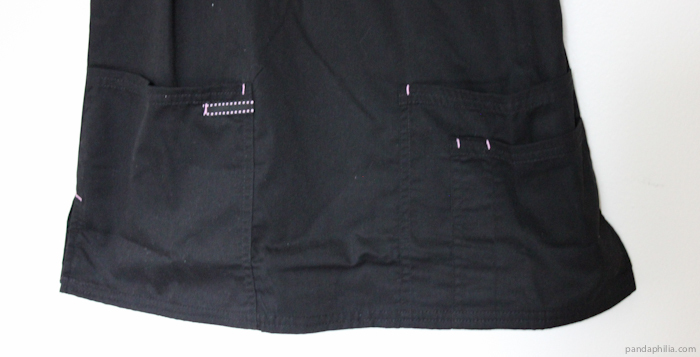 There is even a loop for a pen but I am used to clipping it in my breast pocket, which this scrub top lacks. All the pockets fit so many things and hide them out of view without looking too bulky - I definitely feel like a kangaroo with all this pocket space potential! I'm not crazy about the light pink stitching with the random little X's here and there and would have preferred plain black thread. From afar, the ones on the pockets look confusing and unintentional. The dark colour and material collects lint easily, so that's another downfall. Overall, I would probably not purchase this exact style on my own because of the stitching and lack of breastpocket but there are other fitted designs that I like from their site. If you're a petite lady who has to deal with the scrub life, I feel your pain. 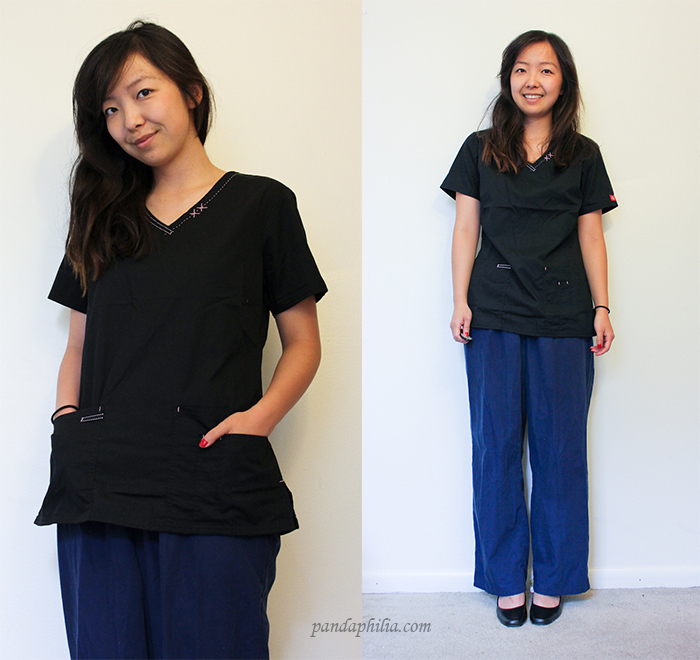 Uniformed Scrubs is offering a 15% discount to all my readers with the code: TRUEBLUE (expires 7/31/2013). You can also follow their Facebook and blog. The scrub top was sent for review by Uniformed Scrubs. These honest opinions are 100% my own. 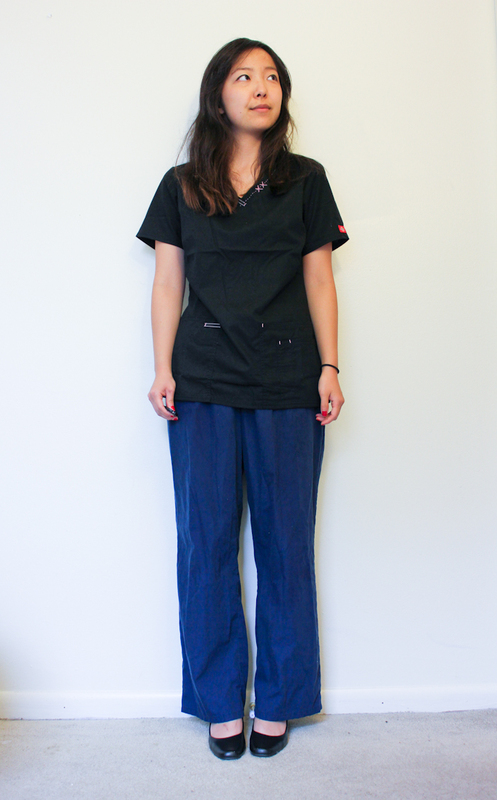 My mom is a nurse, so I know how satisfying it is to find a variation in uniform that is feminine and flattering. Ever since I was young I watched scrubs become more and more stylish, and I love the direction they're taking! Have you heard of Koi brand scrubs? It's by a designer in California I think, and they are my favorite. Sometimes their styles don't even look like scrubs, but something I'd want to wear during the day! 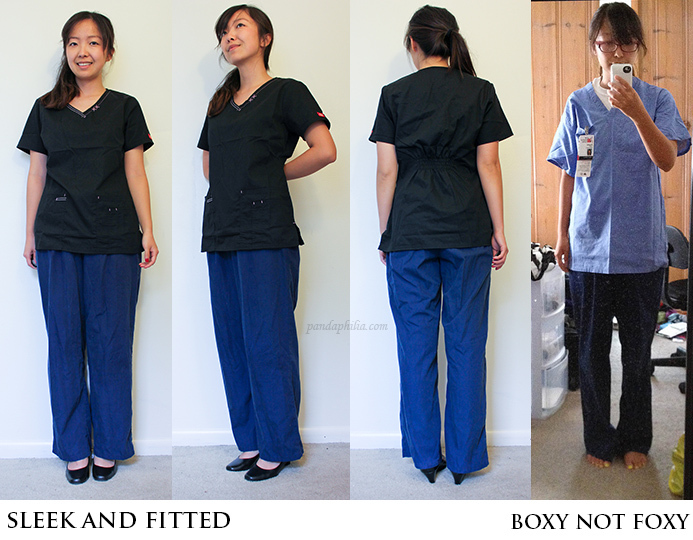 As a former med student (and current intern), I totally understand about the ill-fitting scrubs. As cheesey as it is, I wore Grey's Anatomy srubs. They have petite sizing, and actually look cute. Yes, you'll be mistaken for a nurse, but let's be real, you're a girl. You're ALWAYS going to be mistaken for a nurse. Even when you introduce yourself as Dr. (insert last name here). They also make a fitted, petite-sized doctor's white coat which is GREAT when you're done with the ill-fitting, one-size-fits-everyone-but-me silly short coat of shame they give you in med school. (No, I don't get paid to advertise for Grey's anatomy brand). I'd call this an innovation lol!anything can be made fashionable provided you style it well and carry if off ! And you just did that! Bravo girl! Happy weekend! You look good in this medical uniform. I always prefer buying shirts with pockets as it allows me to carry extra stuff in hospital. My husband is a medical support staff and have just purchased mens scrub pants for him from a leading online store.